Don’t you just hate it when you’re browsing around the Web, minding your own business, and suddenly you see something like this pop up right in front of your bloodshot eyes? 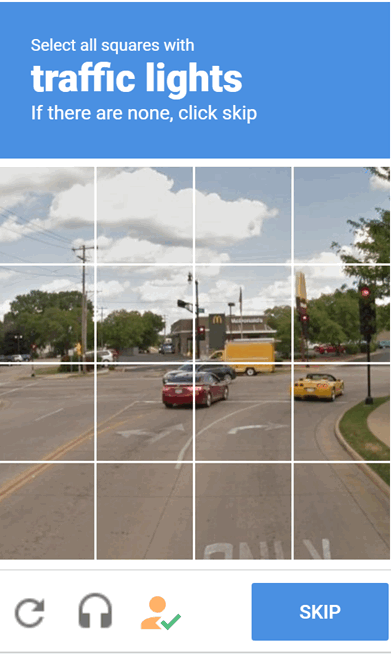 If your eyes are old and weary like mine, you may find it hard to pick out the the things you’re supposed to find in the picture – for instance finding all the traffic lights in the somewhat blurry captcha in the example above. Wouldn’t it be nice if you had a way to automatically solve these crazy captchas without straining your eyeballs and raising your blood pressure? Unfortunately, due to the limitations of technology, there is no 100% perfect captcha solver, but there is an extension that claims to be able to help you automatically solve most captchas so you don’t have to. The extension is available for Chrome, as well as Firefox and Opera. You can install the Chrome extension by visiting this page. If you’re using Firefox or Opera, read on. Buster is a Chrome extension which helps you to solve difficult captchas by completing reCAPTCHA audio challenges using automatic speech recognition. Challenges are solved by clicking on the extension button at the bottom of the reCAPTCHA widget. It is not guaranteed that challenges are always solved, the limitations of the technology need to be considered. reCAPTCHA challenges remain a considerable burden on the web, delaying and often blocking our access to services and information depending on our physical and cognitive abilities, our social and cultural background, and the devices or networks we connect from. The difficulty of captchas can be so out of balance, that sometimes they seem friendlier to bots than they are to humans. The goal of this project is to improve our experience with captchas, by giving us easy access to solutions already utilized by automated systems. I discovered that there’s a lot easier way out of that dilemma without adding more overhead to your browser. Choose the Audio option instead of the picture option. When you do, it will pop up a screen where you play a message and type in what was said, which will be like a phrase from a sentence. I used to waste so much time going over those awfully poor images as many as a dozen times, often without even getting it then. Audio is usually done in one quick try. How is this easier than letting an extension solve the captcha ? You’re still solving the captcha manually, by listening. Why not let and extension do it? Wait. Isn’t the point of these things to PREVENT bots? So if a bot can solve them, doesn’t that render them useless? Why are they even still being used? And why doesn’t everybody just use the ‘I Am Not A Robot’ checkbox thingy? That is way more convenient! Clicking the “I am not a robot” button often leads to the captcha challenge. that deployment of a new reCaptcha mechanism designed to be more human-friendly and secure. system, which decides what type of captcha challenge will be presented to the user. This new version is built on the notion that identifying images with similar content. that the user is required to select. The number of correct images varies between 2 and 4.
solve despite being solvable by bots. reCaptcha more robust to automated attacks.